Did some recent Fiverr commissions and I thought I would share. They’re for an upcoming rpg product which will currently remain nameless, but I’ll link to it here when it becomes available. I like the concept of each of the characters as given to me by the client, and I liked that he was looking for some diversity among the cast. Rolling with the diversity theme, and since he gave me a great deal of freedom to do what I liked with each character, I chose the themes which most commonly seemed to be ‘masculine’ and made them female. 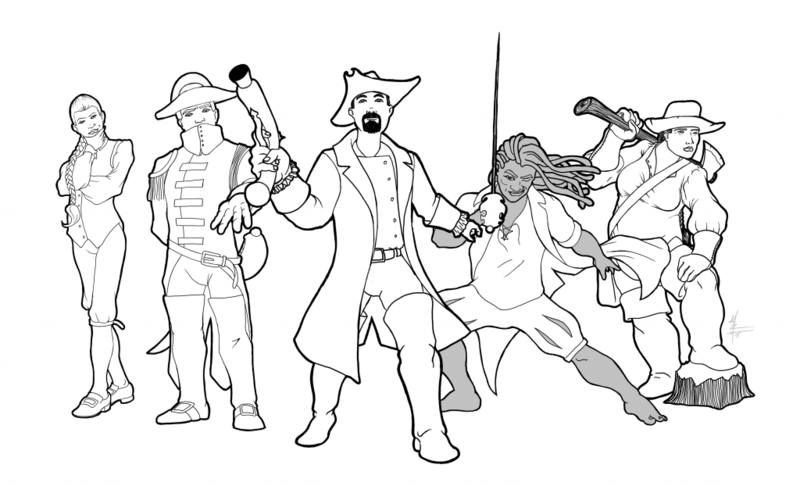 The characters were done as individual commissions – then I quickly assembled them in Photoshop. The sketches were done in Autodesk Sketchbook on my Note 10.1 and the illustration work was done in Open Canvas on my Wacom. I can’t get too much further into details because I don’t want to give away any of the info from the product out of consideration for the client, but I would love to know what you think of the characters. Let me know in the comments below if you have any suggestions / recommendations for how I should have done things differently. Tagged character portrait, characters, commissions, digital art, digital artwork, fiverr, illustration, men, portrait illustrations, sketchbook pro, wacom, women. Bookmark the permalink.